Isaac knew he needed to find a solution if he wanted to keep his company’s productivity from taking a nosedive. “[We had] a need to filter out unimportant emails,” says Isaac. With the SaneLater feature, Isaac was able to take back the hours he was spending sorting through unnecessary emails. Excited by the boost in productivity, he rolled out SaneBox to the rest of the team—to great results. “Our employees all find the email management useful,” says Isaac. In fact, it was such a success that today, 100% of the Intuit Research team is using SaneBox to manage their inboxes and keep their email under control. The Intuit Research team may have originally looked to SaneBox as a way to get their time back—but they found an added productivity bonus thanks to SaneReminders. SaneReminders is a SaneBox feature that works in two ways. First, it helps track emails that need a response. If you send an email and it isn’t responded to in a certain time frame, SaneReminders sends you a reminder to follow up. Second, if you get an email you want to respond to—just not that moment—SaneReminders will send you a reminder to make sure you respond at a more convenient or relevant time. SaneReminders proved to be an invaluable tool for the Intuit Research team. In fact, SameReminders has been such a great tool for the Intuit Research team, they credit it for bringing new business into the company. Ready to learn more about how SaneBox can help you take back control of your inbox, boost your productivity, and help you and your team get more done during the day? 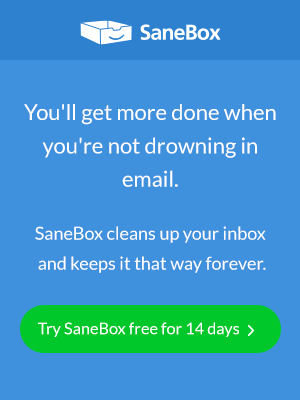 Sign up for SaneBox teams and experience firsthand how SaneBox can completely revolutionize the way you manage your inbox—and ensure important emails never get lost in the shuffle again.